"Individualized tours are now available for the Children’s Center at Dean College. Parents of children ages 2.9 through 6 years old are encouraged to bring their child to explore the school and learn about our program. Applications for fall 2018 are being accepted for five-day morning, two-day morning, three-day morning preschool program or five-day afternoon Pre-K program. 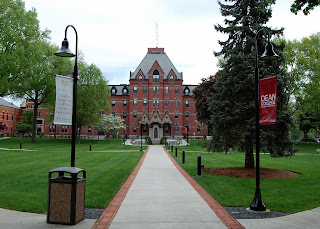 Dean also offers a full-day option (8:30 a.m. - 3:15 p.m.) for 4- to 6-year-olds who will be transitioning to a kindergarten program the following year." "THE BLACK BOX in downtown Franklin is hosting a community celebration marking Franklin’s 240th birthday Friday, Feb. 16, from 7-11 p.m. Enjoy fun Franklin history shared by Joe Landry, along with historic photos and town trivia. The birthday party will also feature music, including a special appearance by Franklin’s own Jamie Barrett, as well as snacks and a cash bar. This special event marks the milestone 240th anniversary of Franklin’s secession from Wrentham in 1778.